On this page you can find 7x7 Sudoku puzzles with hemmed areas in a diagonal pattern (see also the image on the right). The visible numbers are either arranged in symmetrical patterns or unordered. You can create both variations with the current version of the MaaTec Sudoku program. 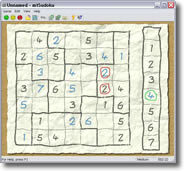 While the symmetrical Sudokus often look more appealing, the generator algorithm can create unordered Sudoku puzzles with slightly more consistent difficulty. Just try both kinds of puzzles to find out, which of them you like more. Solution 60 easy Sudoku puzzles with 7x7 cells (29 KB). Solution 60 medium Sudoku puzzles with 7x7 cells (28 KB).